I first met Erik Olin Wright when I arrived in the University of Wisconsin-Madison as a Ph.D. student in the summer of 2016. Having already read most of his work I could not wait to meet him in person. Indeed, the chance to study under Wright was the main reason for my being there. Upon arriving at his office, I was received with a warm smile and a hug. Erik, as he asked to be called, graciously offered to mentor my research. What stood out about him,even in that first encounter, was not just his brilliant mind but his generosity, kindness, and warmth—often not the case with academics of his stature. Wright left behind an incredible moral and intellectual legacy. Following his diagnosis with leukemia in April 2018, he continuously posted medical updates and lengthy blog posts, full of inspiring lessons about life and death, and serving to connect the many friends, colleagues, and students (former and current) worldwide who loved him but did not necessarily know each other. Born in California and raised in Kansas in a family of academics, Wright studied social science and history at Harvard and Oxford University, before starting a doctoral program in sociology at the University of California, Berkeley in 1971. Upon defending his dissertation, a quantitative study titled “Class Structure and Income Determination,” he was hired in the sociology department at the University of Wisconsin-Madison in 1976, where he stayed until his death. Wright was genuinely inspirational, in every possible way. As a scholar, he was among the most brilliant and influential sociologists of the past century. As an advisor, he was deeply dedicated to his students. Everyone who has studied with him experienced this first-hand. His comments on papers sometimes exceeded the length of the papers themselves, typed out on the margins in a relentlessly constructive and cheerful manner. As a teacher, he had a singular capacity to present convoluted concepts in a coherent fashion. There are many brilliant minds, but they do not necessarily make good teachers. Wright managed to be both. As an interlocutor, he never allowed his ego to interfere in debates, always maintaining an elegant tranquility. Erik was a wonderful human being, a person others would turn to seeking solace. Wright made his first appearance on the intellectual scene in the mid-1970s, along with a generation of graduate students—the famous “1968 generation”—who were radicalized by the Vietnam War and the civil rights movement in the late 1960s. He “fell into Marxism” in the early 1970s since it was, he recognized, “the only game in town” for a serious critical scholar. Throughout Wright’s academic career he exhibited a remarkable, steady commitment to reconstructing a sociological Marxism, treating it not as a set of rigid ideas or an ideological commitment but as a scientific projectand an analytical framework. By the early 1990s, Marxism had declined as an intellectual force following the fall of the Soviet Union. But Wright kept a space open for the study of “class” within the Marxist tradition of the sociological canon through a program called “Class Analysis and Historical Change” at the University of Wisconsin-Madison. Orthodox Marxists had insisted that individuals in every society are slotted into two polarized social classes: capitalists and laborers, determined by ownership of productive assets, or what Karl Marx called “the means of production.” Wright realized that this simplistic and polarized portrait failed to capture the complexities of modern societies, including the advent of a “middle class.” He developed a nuanced version of Marxian analysis that included twelve distinct social classes corresponding with most occupations in the modern, capitalist societies. Wright viewed Marxism as a scientific project—not an ideological commitment—an approach that earned him a wide following. His most influential studies were not published in the leftist journals but in the discipline’s two flagship publications: American Journal of Sociology andAmerican Sociological Review. In 1991, Wright initiated a project known as “The Real Utopias,” seeking to explore a wide range of realistic and achievable proposals for social and economic change within capitalism—proposals that tip the balance of power in favor of the poor and working people. These include universal basic incomeand participatory budgeting. Wright devoted a lifetime to social justice research by reconstructing a sociological Marxism. And he passed away at a time when the political left, in the United States and on the other side of the Atlantic, shows signs of resuscitation. The scholarly community has lost one of its brightest intellectuals, but those of us who knew him also lost a dear friend. 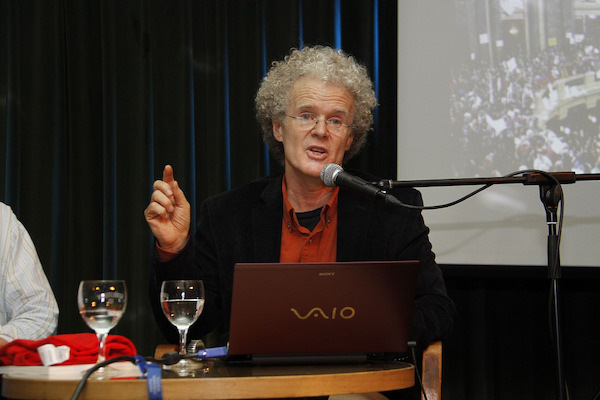 Rest in peace and power, Erik Olin Wright! Your inspiration is eternal. Masoud Movahed is a doctoral candidate at the University of Wisconsin-Madison. He has written for Foreign Affairs, Harvard Economic Review, Harvard International Review, Yale Journal of International Affairs, World Economic Forum and Aljazeera.